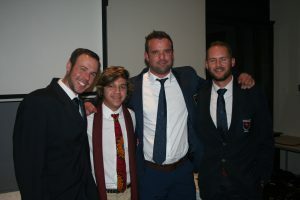 No fewer than 13 new players were welcomed to the Northerns Jarvis/Kaplan squad on Friday evening at a function hosted at Pretoria Country Club. A new look Men’s A side promises a strong performance in the A section, aided in the number 1 position by Egyptian Mazen Hesham. The Ladies will be boosted by world number 17 and Australian number 1, Donna Urquhart as they try to get the win that eluded them by a few points each time for the past 2 years. The men’s squad is full of promising youngsters, notably Callan Hall, Mikael Clayton, Nico Ras, Murray Schepers, Brandon Thomas, Jarrad Rocher, Blaine Verhage and Barry Coetzee of whom only Mikael Clayton and Barry Coetzee have played Jarvis for Northerns before. Apart from the 6 young men and 2 international players already mentioned Northerns also welcome Andrew Martin, Kyle Maree, Justin Cook, Helena Coetzee and Amy Farrel to the squad for the first time. Martin recently transferred from KZN and Maree from Central Gauteng. 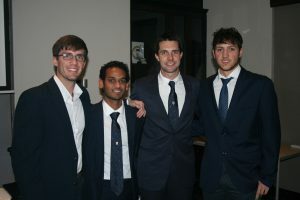 Men’s A side present: Kyle Maree, Gary Naidoo, Andrew Martin, Callan Hall. 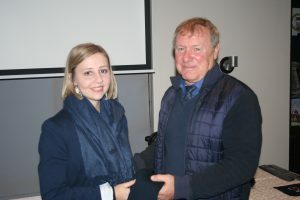 Megan Page, only player of the Ladies A side present with newly elected NSF President Anton Louw. 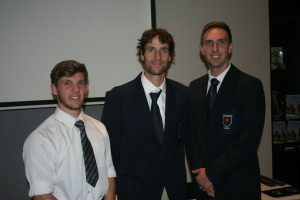 Men’s B side present: Murray Schepers, Mikael Clayton and Craig Ruane. 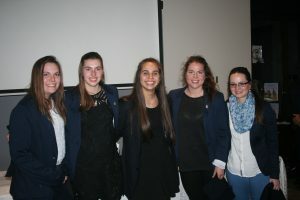 Ladies B side present: Jess McDonald, Jemma Dawson, Helena Coetzee, Kimberley McDonald and Bronwen Martin. 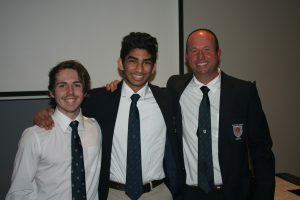 Men’s C side present: Nico Ras, Jason Phillips and Wesley Daniels. Men’s D side present: Justin Cook, Brandon Thomas, Sven Claassen and Matthew Dewey. This entry was posted in News, NSA. Bookmark the permalink.